﻿ Wouldn't it be great if we had a female president? Wouldn't it be great if we had a female president? First of all, I like to apologize about this article because we're not a political website, we're here to support Heather Nova and her beautiful music. However, we're also offering some world news and nowadays the news is dominated by Super Tuesday. You can't escape from it. Have you been following our politics? We could have the first woman or black president in 2008, and I truly believe things will improve significantly with the change! "I'm 100% with Mrs. Clinton, and I hope that she will become the first female president of the USA. I truly think that Obama is not ready to become president because he is less experienced than Hillary and the world needs an experienced president. I think that Hillary is the right answer in our troubled world. 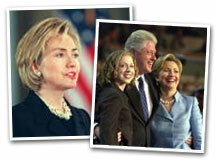 On the website of the New York Times I read that Hillary won in Nevada on January 19, 2008." Mrs. Clinton would be a great president. I believe that Mrs. Clinton would be a great president for the USA because she has a lot of experience and that's what America needs right now and the rest of the world too. Troubled times need an experienced leader and Hillary is the right answer if you ask me. It's not because she's a woman. It's because she's what America needs right now, I believe.